Michael founded SmallGroups.com in 1995 from his basement in Cincinnati, Ohio. With the help of ministry partners too numerous to mention, the ministry grew over the years. Today it is owned and operated by Christianity Today, Inc. Michael continues as an Editorial Advisor and often writes articles for the ministry. Michael is part of the Small Group Network communications team as the ministry’s Twitter Manager (@SmallGrpNetwork). He writes blog posts and works together with others on the Small Group Network team. One of the main goals of the Small Group Network is to help ministry leaders form and connect with others in local or regional “huddles.” Find out more on theor website: http://smallgroupnetwork.com. Michael is a member of the Small Group Churches Team of contributors. The ministry was founded by Andrew Mason, the Small Groups Pastor of Real Life Church, a family of churches in the Nor. CA region. Small Group Churches is the #1 self-hosted online forum for small group point people. Michael is involved in Manhood Journey as a resource developer, writer, and editor of their resources for Manhood Journey groups. He is a supporter of and partner with this ministry in other ways as well. Michael is a regular blogger for Church Central, a ministry focused on building healthy churches, founded by Dr. Thom Rainer and Tom Harper. 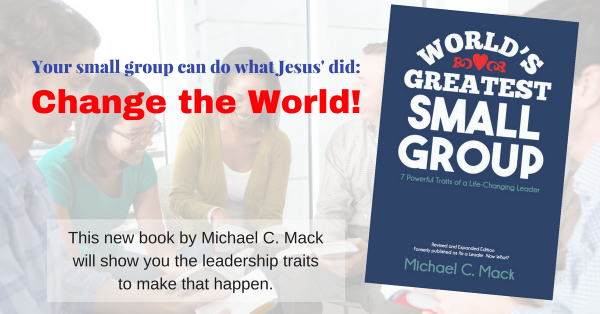 Michael blogs mostly about small group leadership and discipleship. Want to discuss ministry partnership? Contact Michael and set up a time to talk!